If you can write down a function in terms you know – polynomials, sin, cos, exp, ln, and so on – then you can differentiate it exactly using the product rule and the chain rule. The working may be long and complicated, but with just those two rules you can get an exact answer. Integration is very different. Lots of not-very-complicated functions cannot be integrated exactly in terms of the usual functions we know. I don’t mean I can’t integrate them, or you can’t integrate them, or this or that other person can’t integrate them: we know that no function defined in terms of the functions you know is their integral. There is a theorem, called Liouville’s theorem, which proves that: click here for a quick summary of the argument. 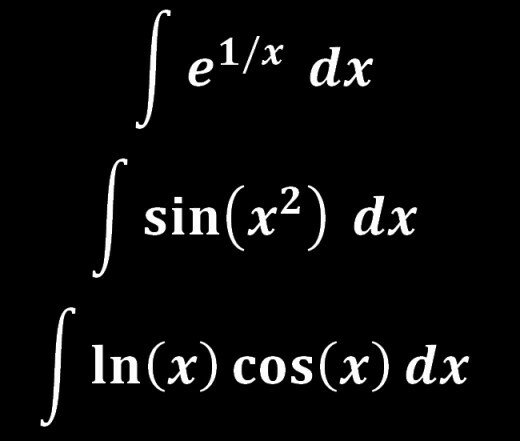 The graphic above lists a few of the integrals you can’t calculate in terms of functions you know. It’s like the story of Theseus and the labyrinth, or Hansel and Gretel and the crumbs: you can find a function whose derivative gives you want you want only by finding the “thread” or the “crumbs” and following them back. Here is a snappy list of functions which can’t be integrated exactly in terms of the functions you know. This entry was posted in C4 maths and tagged Calculus, integration on March 28, 2017 by dlandmj.